If you’re the type of person who observed that The Jetsons family all possessed 60’s haircuts while living in the then distant future, you’re also probably someone who notices that history comes full circle. Musically speaking, this specific instance is referring to Arizona-based five-piece The Word Alive. Cosmetically the group dress in a style that is completely relevant with the times. Their work on latest release Dark Matter, however, sounds as if it belongs squarely in the 90’s alternative metal scene. That’s not to say the sound on this record is dated; on the contrary. In the same way that something considered retro can return and be classified as chic and hip, Dark Matter is simultaneously nostalgic and current. 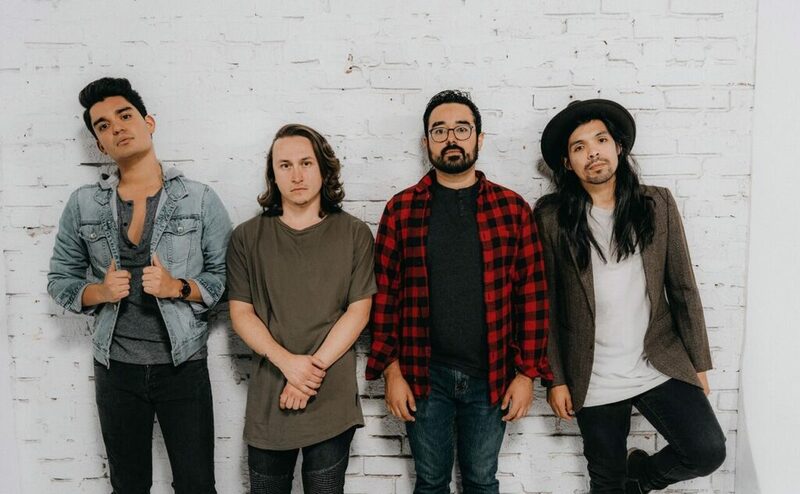 Anyone well-versed in The Word Alive’s music scene can tell you a recent resurgence of an alternative, even grungy, musical style has taken prominence over their peers. That’s not to say TWA are merely tagging along in pursuit of success. The change of style is inspired and well-executed in this case. The first thing TWA’s fans who have stuck around since the days of Deceiver, Life Cycles, or even the recent REAL. record will notice is how straight-forward the rhythm section is. At first, this might disappoint when taking into consideration what drummer Luke Holland, rhythm guitarist Tony Pizzuti, and bassist Daniel Shapiro have shown they’re capable of playing, but their status of fitting into the songwriting for the sake of structure and enhancement of the song’s vibe causes them to shine just as much as they have previously. In fact, their focus on fitting in to the song rather than attempting to stray away with unnecessary technicality is a beneficial decision to providing the record a full band feel. Though anyone in doubt that this record doesn’t have its mind-blowing technical moments in the rhythm section needs to check out the title track immediately. The Word Alive really never have been in finer form either. What is being played out on this record is an exploration of the ambient, the expansive and certainly, the unknown. In that way, the listener will be reminded of space and fittingly so, as Dark Matter‘s album art showcases a black hole engulfing a starry sky in outer space. Cleverly, this also indicates that Dark Matter is topically a record that hones in on the darkest parts of one’s psyche while also reminding that there is still light, even if only slightly, to be found. The cover art and concept of REAL. also tried capturing this idea and while it succeeded, Dark Matter portrays this with a substantially bigger amount of clarity. As a matter of fact, Dark Matter as a whole feels big. From the opening triumphant expanse of “Dreamer” to the sinister depths of the title track, there isn’t a moment where the record doesn’t deliver to its fullest potential. A focus on frontman Tyler “Telle” Smith’s lyrical content means that each idea is communicated to the listener with absolute clarity and the band’s playing reflects that. This shift of perspective provides a much easier decipherable experience. It helps greatly with naturally understanding as well as feeling what the band are conveying and makes what would have been attempts on any other TWA record into unbridled success on Dark Matter. It goes without saying that just by having seen the album art it’s easy to tell that Dark Matter is a more mature record. Whereas themes of vengeance, betrayal and ultimately, tortured souls have been portrayed by TWA before, the lyricism is more accessible and defined this time around, making for an entire song that feels a certain way and not just the lyrics. The overall theme is loneliness throughout and that parallels the anthemic nature of most choruses Telle sings on the record. A great example of this is “Suffocating”, a track about feeling beaten down by struggle in which Telle sings one of the biggest hooks on the album. It doesn’t sound uplifting, instead it feels quite distressed and that much more affecting. In the final moments of the record through the closing track “Oxy” we hear lament and sorrow in Telle’s voice. These aren’t small, easily over-looked emotions he’s referring to. In portraying his real feelings Telle has learned how to convey moods and that, more than his now expanded vocal range, is a testament to how much he has improved as a vocalist. Interestingly, a nice portion of diversity is demonstrated. “Dreamer” picks up where closer “Collapsing” on REAL. left off with its atmospheric, prog rock style, massive build-up and chorus in tow. In many ways this is the biggest song on the record. Then there’s solemn anthems like “Face To Face” and the beautiful “Insane”. Where the album will alert and stick most, however, is in its ominous precipices. “Trapped” and “Oxy” specifically ooze depression. The most interesting track stylistically on the album is ‘Sellout’ with its punk rock-influenced rowdiness, huge, organized chorus and an ambient bridge that soothes before a crushing finale. When the album wants to decimate it certainly does, both instrumentally and thematically. When the album wants to crush, it certainly does, both instrumentally and thematically. The breakdown in “Grunge” specifically is one of the hardest hitting moments in The Word Alive’s entire discography. But then there’s the claim Telle makes in “Dark Matter” that “Hell is waiting for him” that hits just as hard as any breakdown ever could. The common theme as mentioned is abandonment and standing alone. This record is definitely the most we’ve heard Telle open up about himself and through most of it, he hones in on having to accept without choice being left on his own. This factor only makes the anthems of the album hit harder, knowing that such hopeful moments and lessons coming from Telle are just as much directed towards himself as they are towards his listeners. The main point that should be made is that this certainly isn’t the same The Word Alive that made Empire nor Deceiver. Back then this record’s existence would not make quite as much sense. Through the years of balancing darker expressions and uplifting anthems this record brings those dualities together perfectly. Take for instance the vengeful nature of “Grunge” paired with its clips of revving engines and Breaking Benjamin-esque rhythm-heavy riffs, or the anthem of defiance and determination of “Made This Way” that is just begging for mainstream radio play and loud, receptive audiences. The progressions in songs like “Trapped” and “Dark Matter” will keep the listener interested and simultaneously carry on The Word Alive’s progressive tendencies. However, there are no moments on Dark Matter that TWA could have been playing all of those years ago. Massive choruses and huge songs were always potentially in the band’s future, but this is a significant jump forward that goes beyond those simple ideas. The improvement on all fronts, be it Zack’s tastefully jazz-influenced shred solos, Tony’s rock-solid wall of rhythmic slabs, Luke’s absurd skills behind a drum kit, Daniel’s adventurous bass playing, or the less distracting and more enhancing ambient electronics, TWA had to hone their skills to make this record. No one had to do so more than Telle though, who learned how to sing and scream from the ground up when entering the band. His skills have come purely from performing and he has developed into an energetic and expressive vocalist. The unbelievable high shrieks in “Sellout” are just as impressive as the higher singing register he reaches in “Branded” (his highest to date). It’s also truly interesting to hear him harmonizing with female guest vocalist, Alicia Solombrino, in “Piece of Me”. Be it through plentiful or dismal amounts of hope, Telle sounds ever inspired and ready to push himself. To finalize, is Dark Matter a brutally heavy, aggressive record? No, it’s not and that’s fine. Instead it relies on the emotions, vibes, developed musicianship and delivery to bring an all-around impactful and consuming experience. This album can’t be measured in one or two dimensions. If anything is the future for rock and metal, it’s The Word Alive’s incredible chemistry. And that’s the heaviest sentiment of all.